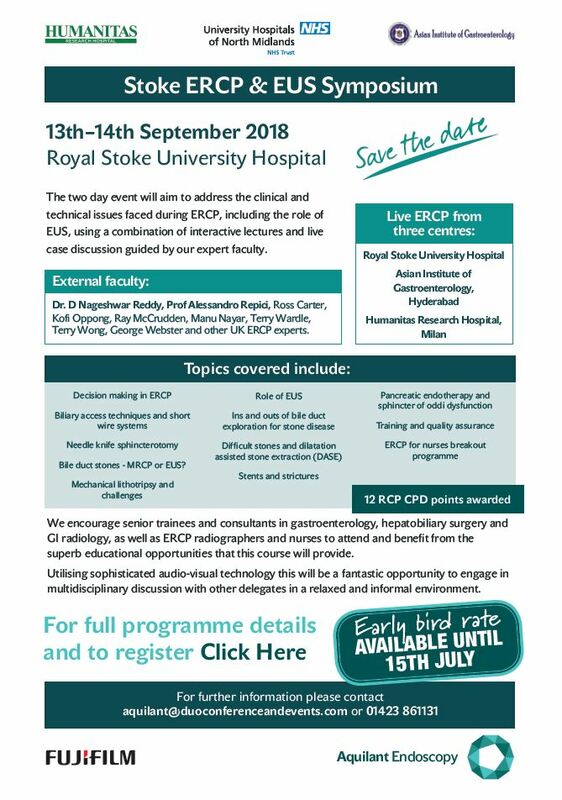 Join the Stoke ERCP & EUS Symposium 2018. The Stoke International live ERCP-EUS symposium is a two-day event that aims to address the clinical and technical issues faced during ERCP, including the role of EUS in ERCP (ERCP/EUS interface), using a combination of interactive lectures and live case discussion guided by expert local, national and International faculty. Senior trainees and consultants in gastroenterology, hepatobiliary surgery and GI radiology, as well as ERCP radiographers and nurses are encoured to attend and benefit from the superb educational opportunities that this course will provide. Join the 4th Athens International Symposium – AIS 2018. The 4th AIS 2018 extends further than the prevention of gastrointestinal cancer topics and includes update lectures in gastroenterology. The symposium aims to deliver some of the highest quality endoscopy training and research in the world. The symposium will mix live case demonstrations from leading world-renowned experts with state of the art lectures and interactive workshops. The focus of the meeting will be on sharing the latest updates in digestive diseases, gastrointestinal cancer prevention & management as well as recent endoscopic technology advancements & endoscopy practices. Read the abstract on a randomized tandem colonoscopy study, showing that LCI could reduce the miss rate of neoplastic lesions in the right colon. 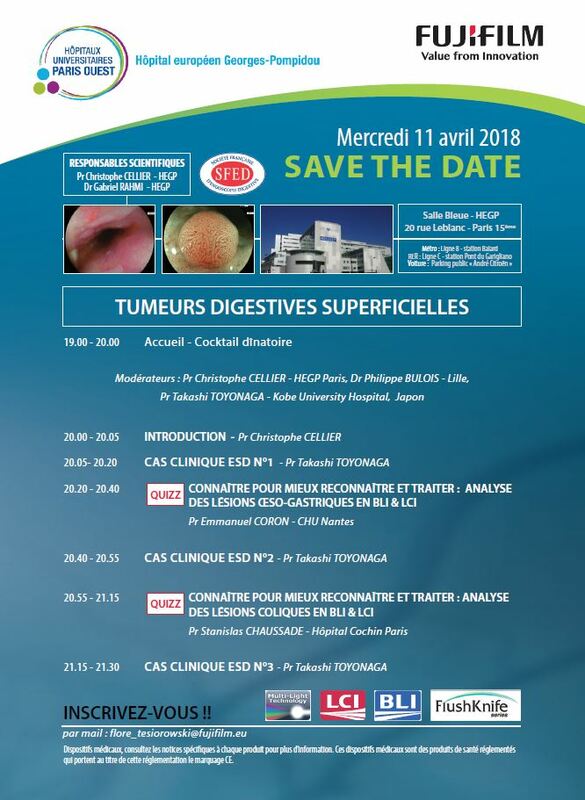 Join a special Evening Event dedicated to superficial digestive tumors, taking place on Wednesday April 11 at the Georges Pompidou European Hospital in Paris. This Evening Event as first of its kind is lead by Prof. Christophe CELLIER and Dr. Gabriel RAHMI (HEGP Paris) with the support of FUJIFILM France and the SFED partnership. Learning about the detection and characterisation of lesions with the help of virtual chromoendoscopy and particularly with the help of LCI & BLI modes. ESD of the lesions, with three sessions of clinical cases proposed by one of the world masters of this technique, Prof. Takashi TOYONAGA (Kobe University Hospital, JPN). 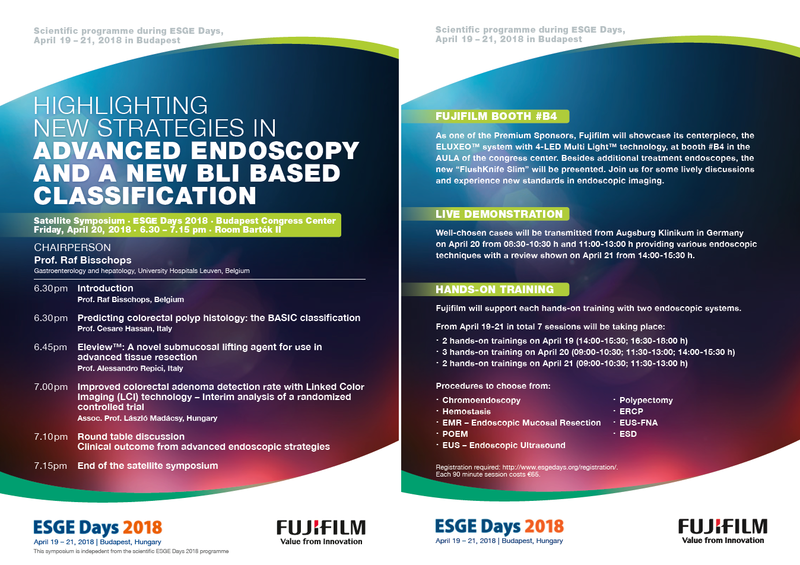 Join the Satellite Symposium “Highlighting New Strategies in Advanced Endoscopy and A New BLI based Classification” with the chairman Prof. Raf Bisschops (University Leuven, BEL) on April 20 during the ESGE Days 2018. The ESGE 27th Annual Congress (ESGE Days 2018) will be held on April 19-21 in Budapest, Hungary. ESGE is European Society for Gynaecological Endoscopy. ESGE Days 2018 will be the medium where experts from Medical and Gynaecology will get together to discuss concepts and assessments to advance knowledge for Medical, Health Care, Oncology, Gynaecology, Laparoscopic Surgery, Endometriosis and Urogynaecology subjects. 78.000 attendees are expected to visit this year’s ESGE Days Congress. The Training Module on the Application of BLI for Barrett’s Oesophagus is now available with an improved usability. This tool had previously been developed in cooperation with Prof. Jacques Bergman (AMC, NL), Prof. Oliver Pech (Regensburg, GER) & Prof. Raf Bisschops (Leuven, BEL). Log in and discover the tool here. 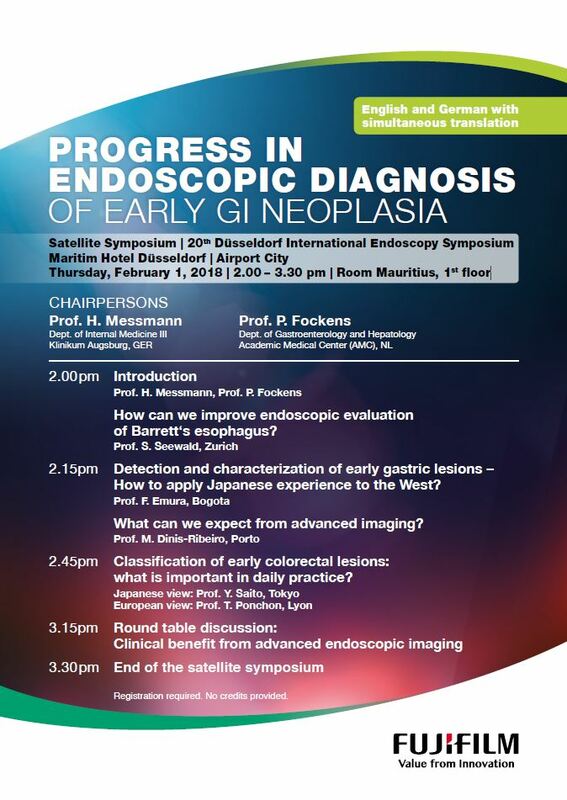 Join the Satellite Symposium “Progress in Endoscopic Diagnosis of Early GI Neoplasia” with the chairmen Prof. H. Messmann (Klinikum Augsburg, GER) and Prof. P. Fockens (Academic Medical Center, NL) on February 1st during the the 20th International Endoscopy Symposium Düsseldorf. The 20th International Endoscopy Symposium Düsseldorf will be held on February 1-3 in Düsseldorf, Germany. 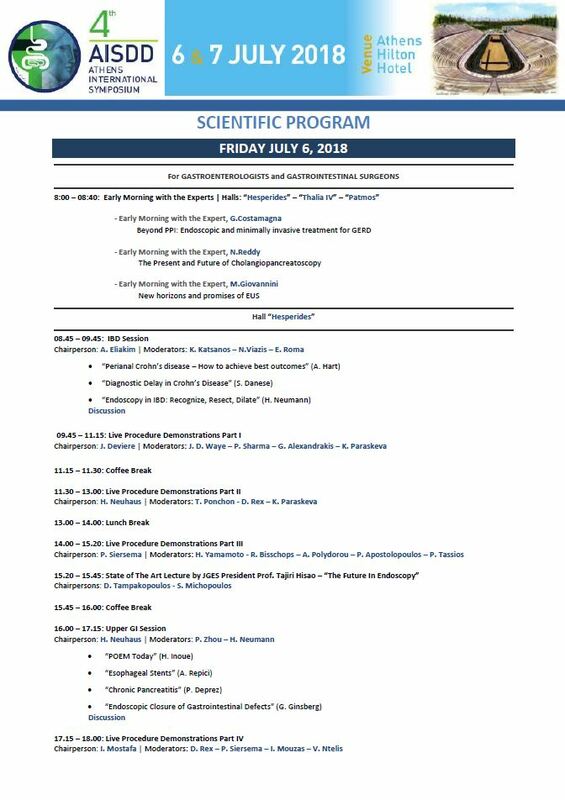 Since the first meeting the goal is to highlight latest developments in endoscopic imaging and minimally invasive approaches to gastrointestinal and biliopancreatic diseases. 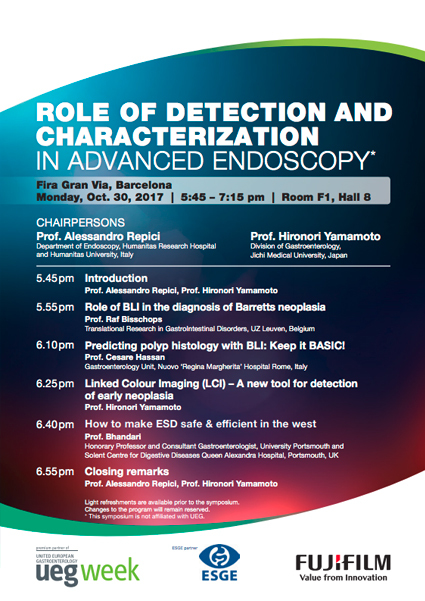 Join the Satellite symposium “Role of Detection and Characterization in Advanced Endoscopy” with the chairmen Prof. Alessandro Repici (Italy) and Prof. Hironori Yamamoto (Japan) on October 30th during UEG Week 2017. The 25thUEG Week 2017, organized by the Society of United European Gastroenterology, is the largest and most prestigious GI meeting in Europe and takes place on Oct. 28th – Nov.1st at Fira Gran Via, Barcelona. Join the symposium “Blue Ligh Imaging: Neues Licht. Neue Erkenntnisse?” on September 15th during Visceral Medicine 2017, the 72th Annual Conference of DGVS with the chairmen Prof. Neuhaus (Düsseldorf) and Prof. Kiesslich (Wiesbaden). Visceral Medicine, the 72th Annual Conference of DGVS takes place on Sep. 13 – 16, 2017 at Messe Dresden. Read the new abstract: Assessment of Endoscopic Mucosal Healing of Ulcerative Colitis Using Linked Colour Imaging, a Novel Endoscopic Enhancement System.